Can you ask SpaceX media people for status Chris? Pacific Warrior is the tug that would be towing ASDS. NRC Quest doesn't tow an ASDS; it's a logistics support vessel. They'd be in bed, but we're running out of SpaceX media folk. Another one's left - Phil Larson (got a great job offer elsewhere). May have read over it, but where would they take cores from here? HQ first or elsewhere? Dawn is officially at 6:31am, so the lighting is about to get a lot better. 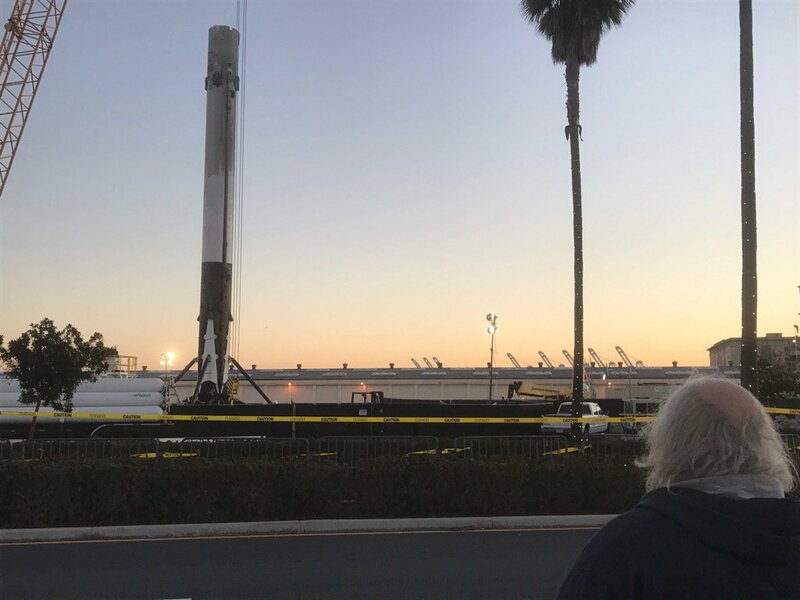 @ABC7 #ABC7Eyewitness The @SpaceX Falcon9 rocket that flew out of Vandenberg Saturday just reached the Port of LA on a barge. #wheresAir7HD? This webcam is no use other than to show dawn is breaking. Here's another full res, I think. Very space-fictioney. @NASASpaceflight No problem! Here's one more. Bravo, looks as great on the west coast as it does on the east. Looking forward to reflights and re-recovery. some of these pictures with the hanging lines from the crane next to it show a small lean on the stage; not much at all, but a bit. There was quite a swell during the landing so we probably shouldn't be surprised.